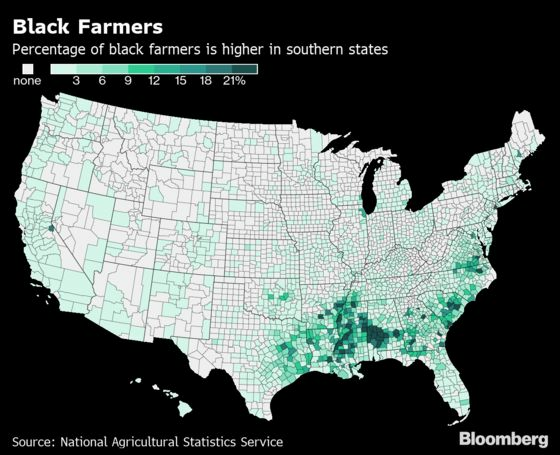 (Bloomberg) -- The number of black farmers in America has gone up, but to look at that number in isolation would be to mask the vast disparities that fall along racial lines. There’s also an income gap, with 2,349 black farmers running operations that made $50,000 a year or more in 2017, compared with 492,000 for white farmers. For decades, black farmers have claimed unfair treatment by the U.S. government, saying bias against them in lending contributed to the small numbers in agriculture. Boyd’s organization has been trying to promote involvement from younger black people to get into agriculture. Some farms are starting to sprout up in urban cities as people seek to produce their own healthier food. Still, in traditional farming communities, black people from farming families may be dissuaded from carrying on after seeing the struggles of elders, Boyd said. He said he doesn’t expect things to get better under President Donald Trump’s administration, saying that USDA Secretary Sonny Perdue has yet to meet with his group. Boyd provided Bloomberg with letters dating back to mid-and-late 2017 to Perdue, inviting the secretary to speak at the organization’s annual conference, as well as for a meeting. Meanwhile, Perdue, speaking to reporters on Thursday in Washington, said he meets “with black farmers all the time” on the road and other places, and said that he’s not aware of any requests for meetings with black farmers that have been turned down.